Municipality of Jasper, AB – Middle of winter. Need to get away, put stress, work and house behind me, create a temporary relief from the must-dos … Jasper comes to mind, and gets chosen as a great destination for winter activities, a little socializing, and relaxing. The trip towards the mountains on a Thursday early afternoon was pleasant. Two friends, one driving the big & shiny truck, three of us sharing in the excitement of this planned getaway and admiring so many things on this straight highway we are traveling on… Also enjoying the many snacks we carefully packed. Arriving in Jasper, it only takes a few minutes to find our hotel, on the far end of this small town. On one side of Jasper’s Main Street called Connaught Drive, a large CN yard, in the forefront of impressive mountains, reminds us that this town was built by the CN, and remains to this day a “railroad town”. Registration is prompt at the Lodge, our hosts are courteous, and the room is pleasant and spacious. We are happy with our well-equipped kitchenette and little fridge, as we stocked up on groceries to be able to enjoy snacks and the option of having a light breakfast in our room if we so choose. On our first night in Jasper, we chat happily over dinner, excited about this outing we planned for the next day, the Icewalk in Maligne Canyon, a popular excursion we hear that caters to thousands of international visitors every year! First thing in the morning of Day 2, after enjoying a relaxing breakfast of scrambled eggs and various fruits in our room, we make our way to Jasper’s Downtown core to pick up our tickets for the 1pm adventure. We drive around for a short while, re-acquainting ourselves with a town that’s full of spirit and interesting homes that show an interesting history and their owners’ tender care: Connaught Drive and Patricia Street are filled with interesting architecture and colorful storefronts. From Candy Bear’s Lair to J & D Gifts, numerous restaurants and pubs, the Jasper Brewing Co. and the Ded’ Dog are very popular and imposing structures like Patricia Square and the new fire hall, Jasper delivers an obvious pride of its existence and a spirit that cannot be stifled. The crowds everywhere are reasonable and friendly: either people are on a holiday or they are local residents, choosing to be friendly to these tourists. The Maligne Tour Company van picks us up at the Lodge and we happily climb aboard, smiling at our guide’s warm welcome. Ben is a Toronto native who has a passion for this town and an impressive knowledge of the region; having been a tour guide and shuttle bus driver here for several years, he needs minimal prompting to share tales of lore and humorous legends… He is the first of many articulate and passionate ‘ambassadors’ of this region we would meet in the four days and three nights of our Jasper holiday. 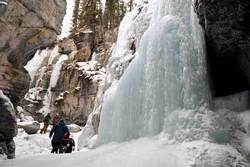 As part of a group of 10, we pay attention to our guide’s safety instructions and enjoy his detailed explanation of the Maligne Canyon and its impressive, awesome rock and ice formations. Running into two groups of ice climbers is an unexpected treat, and we walk away reluctantly, as watching them climb on frozen waterfalls is a fascinating sight! Our cleats guarantee us a more solid footing on the icy bed of the canyon. We see ice towers rising from the Canyon bed, and waterfalls frozen in time, descending from the cliff’s top, sixty or eighty feet above us. We all watch for each other and between the three of us take hundreds of photos of that grand canyon! That night, after getting referred to a popular bar called Downstream, we discover above it a quaint restaurant called Fiddle River Seafood: it is filled with antiques and ocean-themed art and fun ornaments. Our server is Lonnie Keetl, an attractive and super-fit, friendly lady who has quite a story to tell. We enjoy the short menu and our incredibly delicious, well-presented meals. This was a memorable dining experience, and I enter the Fiddle River into my travel notes! The next day, it’s time to put our favorite winter sport to the test. We head for Pyramid Lake, where a rustic bridge takes us –hiking- to Pyramid Island that we circle in haste as there is a bitter wind attacking us: we get back to shore and decide to explore on our snowshoes. Sheltered from the wind among tall conifers and poplars, we can now enjoy the day and the view more pleasantly. We “break a trail” on the side of a mountain and are excited to be doing some Extreme Snowshoeing as some areas don’t display any human tracks! After this challenging trek, we decide to choose a second location to explore before our return to town. We decide to explore Patricia Lake that also offers us a mountain trail that we choose to follow, in powdery snow. The view around us is awesome, magical, and I have no problem understanding why this region is such a tourist attraction. That evening, we drive around Jasper and choose a “sure thing” for a late dinner: Earl’s is a favorite of each one of us, and we enjoy a fantastic dinner there, as well as excellent service. My “Dijon-glazed BC salmon” was baked “al forno”, an open birch-fed oven that is a slowly disappearing feature of Earl’s past. The young chef is Curtis Streeter, a fairly new Jasper resident who also talks with passion about the town and this classic eatery. The Jasper Brewing Co. is a spacious, hopping bar where we made the acquaintance of Alex Derksen, a friendly owner who proudly talks of their on-site micro-brewery: they have this successful formula where they brew beer for their bar patrons. We met another friendly owner, Brett Ireland and his lovely wife Crystal. The other ventures of the Bear Hill Brewing (.com) are the Banff Ave Brewing Co. and the brand new Wood Buffalo Brewing Co. in Fort McMurray; a dream of a Calgary Brewing Co. pub might be shaping up! It seems that this attraction for Jasper and the mountains has trapped many here for lifetime stints, in a town that offers many amenities, a solid charm and challenging activities. Departure day allows us a last snowshoeing adventure on the marvellous Lake Edith just outside of Jasper’s municipal limits, at the foot of Mount Edith Cavell. After a brisk trek in virgin snowy hills, it is time to say goodbye to Jasper. We are wide eyed and alert to all the majestic beauty around us as we make our way out of Jasper National Park, and feeling a bit sad, promise ourselves that we will be back before the spring. Au revoir, Jasper, can’t wait to see you again!